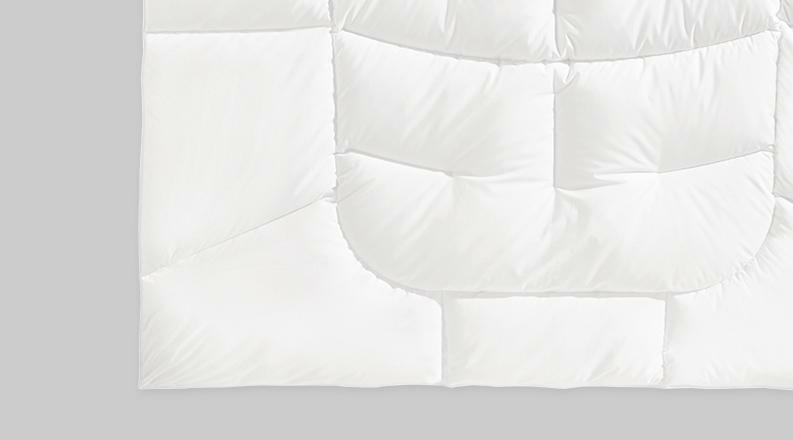 Luxurious duvet filled with grade 1 quality Canadian white-silver 100% goose down. Ultra thin satin bag, 63% Lyocell fibre (Tencel®) and 37% cotton. Medicott® treatment. Two Imperial duvets can be combined with independent snap fasteners. 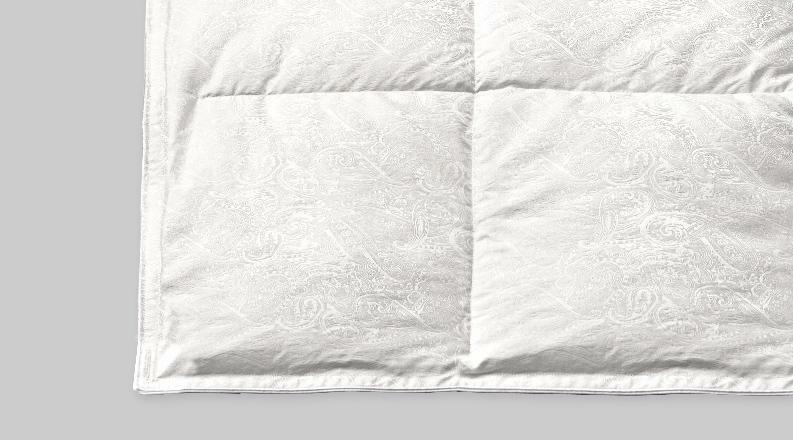 Light and soft, the Royal duvet provides perfect sleeping comfort all year round. 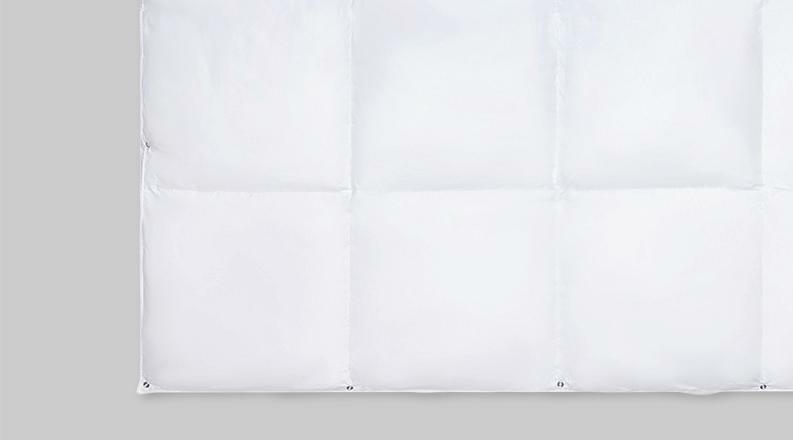 With an ultra light 100% nano-batiste cotton bag, the filling is made of grade 1 quality Siberian white goose 100% down. Two Royal duvets can be combined with snap fasteners. Light and soft, the Royal 4 seasons duvet is composed of a royal summer duvet and a Royal autumn duvet. 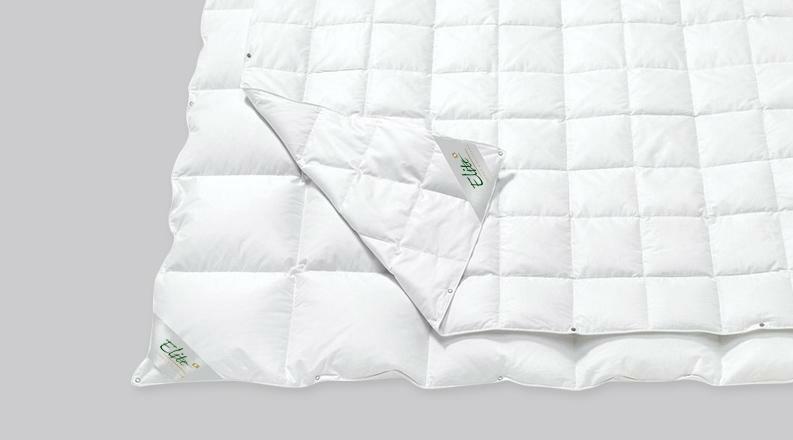 Both are filled with 100% high-quality Siberian white goose down. Ultra light 100% Nano-batiste cotton bag. They can be used separately or assembled via the snap fasteners depending on the season. 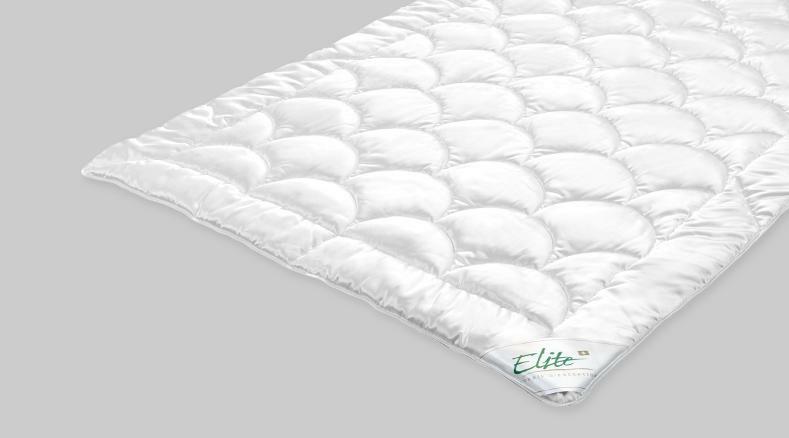 Modern and adaptable duvet system: Elite springtime, summer, autumn with a 90% category 1 quality European goose down filling and a 100% fine Mako batiste cotton. Two Elite Luxe duvets can be combined with independent snap fasteners. By favoring natural materials as well as non-industrialized production, Elite has always taken into account the protection of the environment and has preserved the health of its customers by excluding any harmful substances from its products. Indeed, it is now proven that all chemical components inhaled during sleep are found at one point or another in the bloodstream. 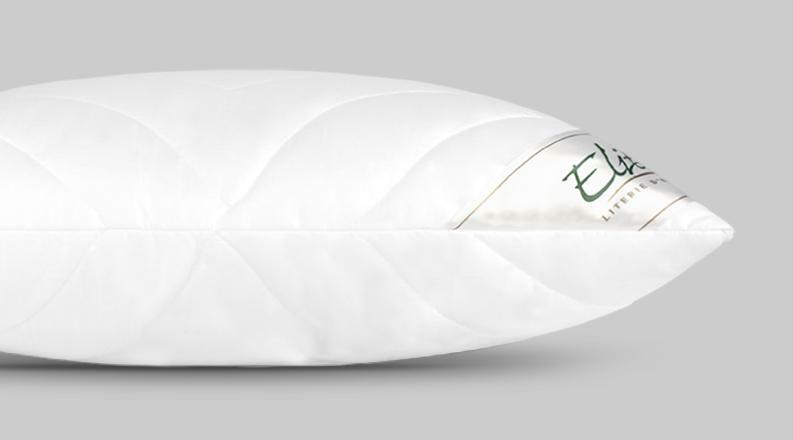 The Elite Luxe 4 seasons duvet is composed of an Elite Luxe summer duvet and an Elite Luxe autumn duvet. 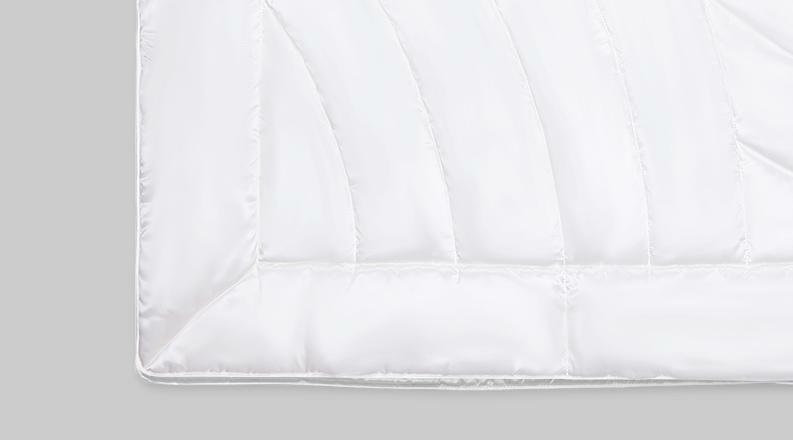 Both are filled with 90% premium quality European goose down. 100% Fine Mako Batiste cotton bag. An excellent alternative instead of using down or synthetic materials. This duvet is 100% pure cashmere. A luxurious material selected for its lightness and extreme softness, cashmere is highly absorbent while providing remarkable heat regulation. Ultra thin nano-satin bag, 100% Mako cotton, with medicott® treatment. Naturally cool light and soft duvet, made of pure wild Tussah silk. Pure silk is a natural filling ideal for spring/autumn and summer duvets. 100% silk ultra thin satin bag. AIR-FILL® functional fibre anti-allergy duvet, exceptionally breathable, regulating moisture to ensure a warm and dry sleeping atmosphere. 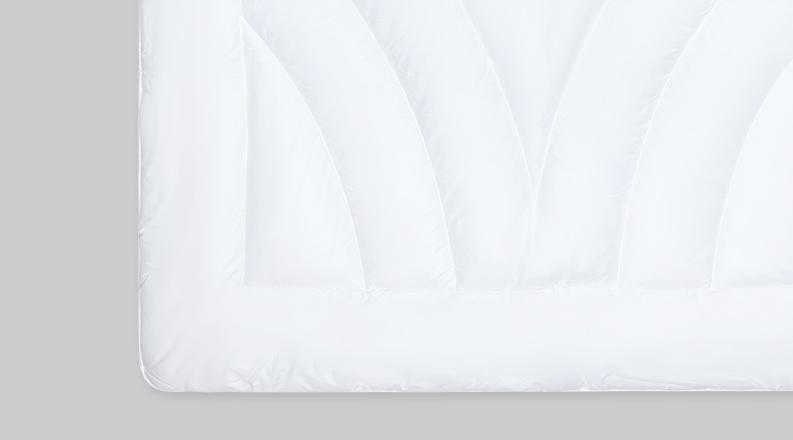 Thanks to the anatomical stitching, the duvet adjusts to the sleeper's body giving the sensation of a cocoon. AIR-FILL® lining, 100% polyester. Fine satin bag, 54% Micro Tencel®, 40% cotton, 6% silk. 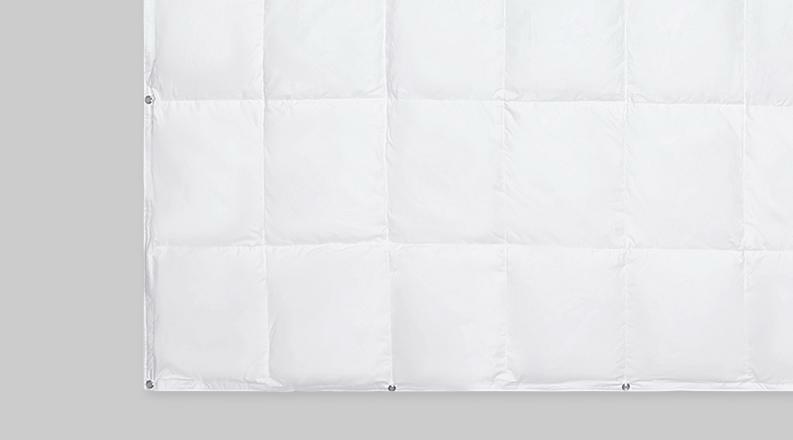 Thermo-regulating quilt with innovative Outlast® technology originally developed for NASA. It proactively adjusts the balance between temperature and humidity. Fine 100% Mako Batiste cotton bag, treated with Aloe vera to give an extremely soft surface, medicott® treated. 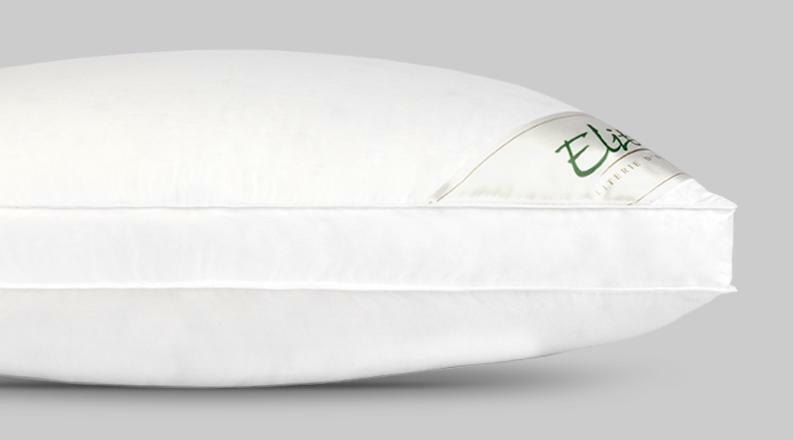 This pillow provides outstanding restful sleep. The lining supports the head and neck while the outer fabric has a very luxurious feel. Core filled with high-quality 90% Siberian goose down, 10% feathers. Ultra thin 100% nano-Mako Batiste cotton, medicott® treated. Edge finishing. 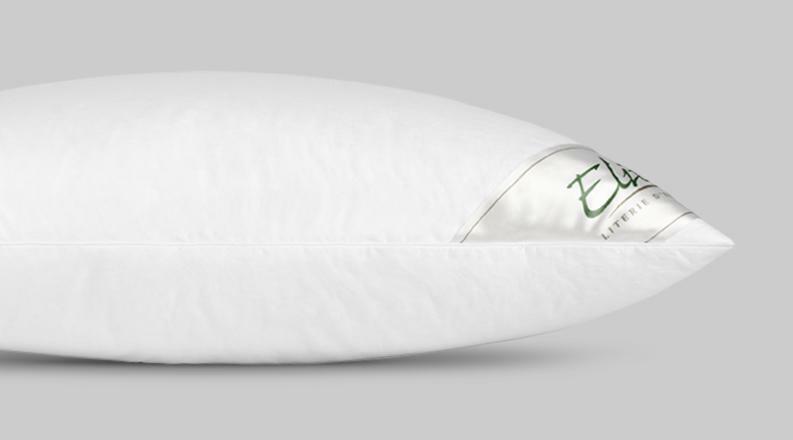 A pillow with a touch of luxury. Ideal for those who love the luxury of a soft down filling but who want support. The inner core with new 90% down and 10% European white goose feathers. The outer part is made with 100% new white goose feathers. Category 1 quality. The finest Satin bag, 100% Mako cotton. Edge finishing. 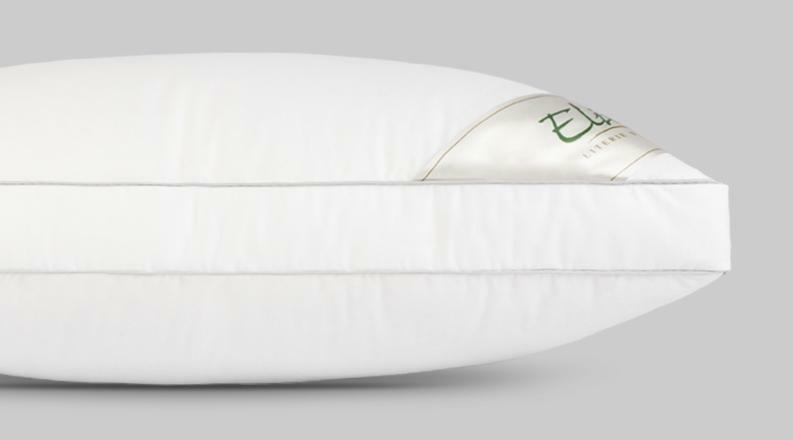 Natural, beautiful, soft, luxurious pillow with an external flat section designed to allow the lining to provide volume and support to the edge of the pillow. It is specially designed for those who prefer to sleep on their side. Lining in highest quality 90% new white down and European goose feather. 100% Mako cotton bag with medicott® treatment. Gold colour edging finish. 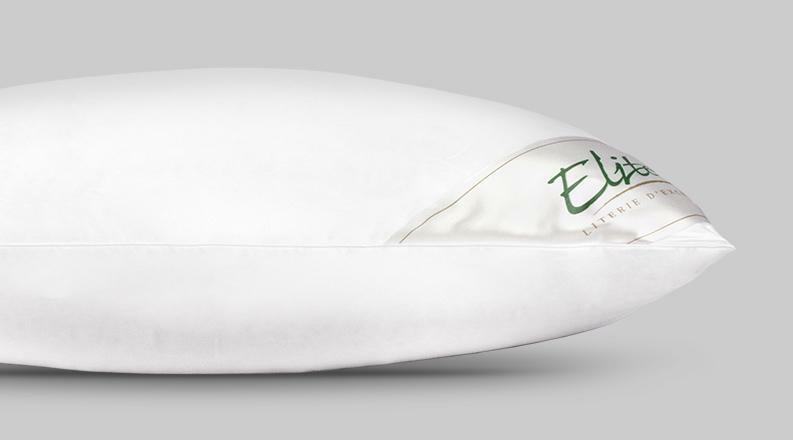 Available in three levels of firmness, the Elite Luxe pillow combines know-how and innovation to create supreme comfort. 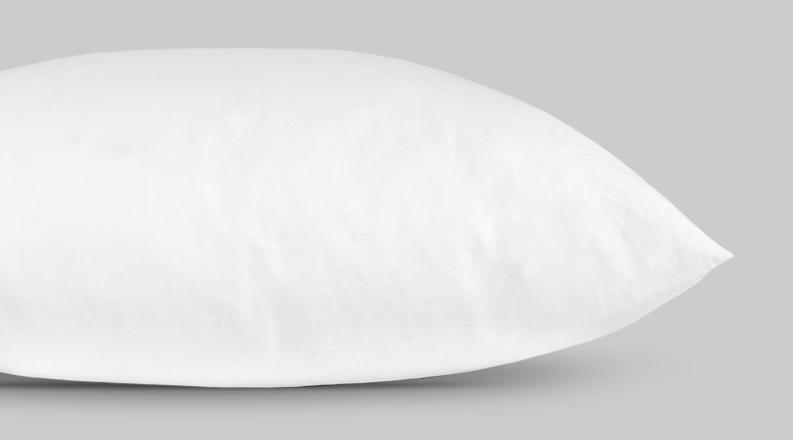 The inside of the pillow consists of three parts: central core lined with a mixture of 100% new white goose feathers; and two outer sections with 80% European goose down and 20% feathers. Category-1 quality. Cotton twill bag, 100% Mako cotton, medicott® treatment. Edge finishing. 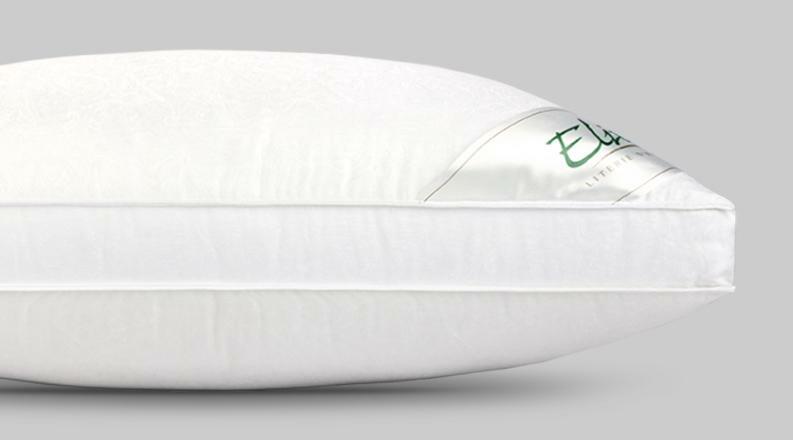 Pillow made with innovative Outlast® thermoregulation technology. Temperature variations are indirectly compensated by the Outlast® micro-capsules. Thermofill® Plus padding, 100% hollow fibre polyester beads. Fine 100% Mako cotton bag, medicott® treatment lined with Outlast®. 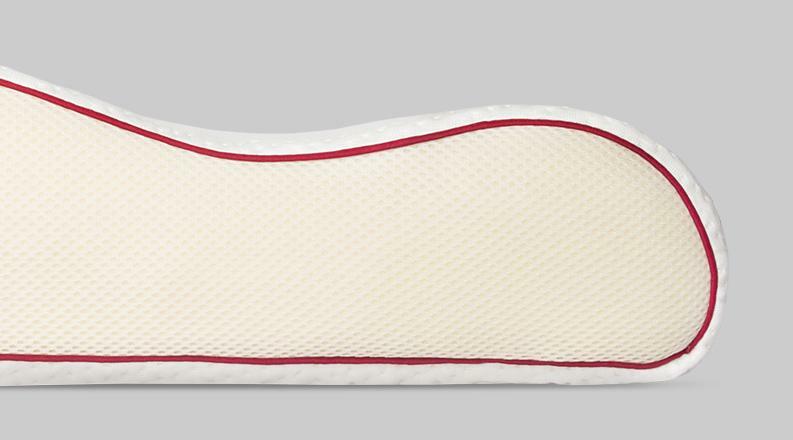 This pillow provides excellent support for a healthy sleep. The numerous fibre balls adapt to head movements providing comfortable support. Supreme Comforel® padding , 100% polyester ball. 100% Mako cotton satin bag, medicott® treatment. White edging finish, zipper and extra bag of lining. 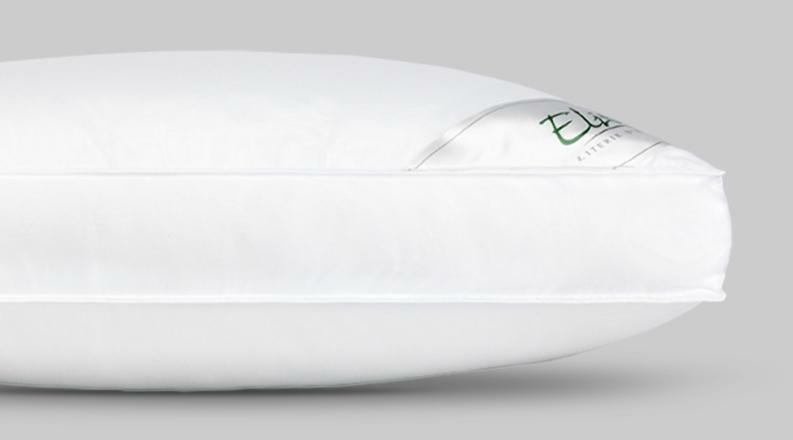 The Ergogel ergonomic pillow provides anatomic positioning for the head and shoulders. The combination of a visco-elastic core with a soft gel layer ensures positioning that adapts to the shape of the cervical spine and relieves pressure on the shoulder muscles. Bag made of 45% Lyocell (Tencel®), 28% polyamid, 25.5% polyester, 1.5% elastan. Zipper finish. Decorative cushions filled with 15% goose down and 85% feathers. The outstanding Swiss quality products are specifically designed for you.